As the men’s hockey team prepared for the stretch run of its season, the players knew that points would be at a premium in the final four games of the campaign. With only in-conference matchups remaining, every minute on the ice could determine whether or not the Cardinals would host a playoff game at Spurrier-Snyder Rink. After going 1-1 over the first two games of this stretch, Wesleyan will likely have to sweep its two-game series this weekend with Trinity to claim home ice. After last season, in which the Cardinals finished with four wins during the entire year, this year has marked a nice change for the team’s veterans. Last Friday night, in front of a enthusiastic home crowd, the team welcomed the Bowdoin Polar Bears to town for a rematch of the Jan. 13 matchup in Brunswick, Maine. After besting their familiar foes by a 5-3 margin on the road, the Cardinals looked to close out the regular season series with a sweep. They did so by replicating their last meeting, in a 5-3 win in which the Cardinals controlled the final period. The Redbirds were the first team to find twine in the game when Dylan Holze ’18 found Chad Malinowski ’19 for a shot on target, which was deflected by Walker Harris ’20 past Bowdoin Goalie Peter Cronin for his eighth goal of the year. 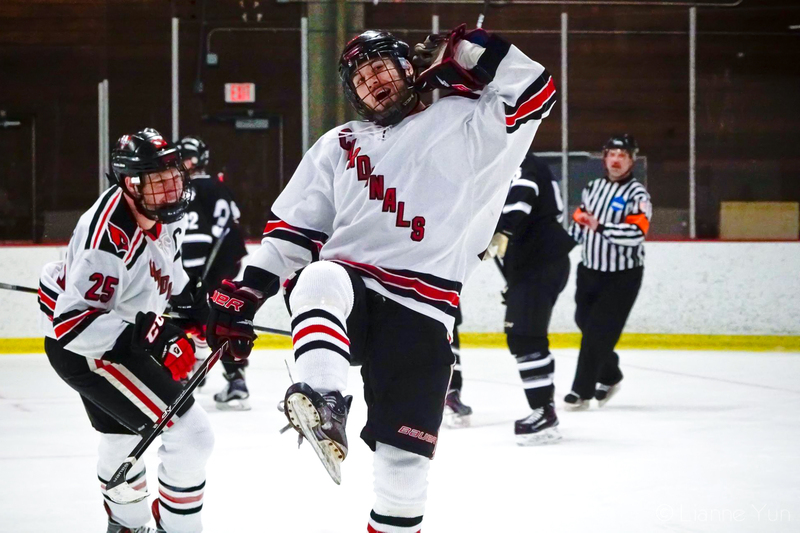 Just three minutes later, however, the Polar Bears answered with a score of their own, as Cody Tedesco buried a rebound off Wesleyan netminder Dawson Sprigings ’17 for a goal. 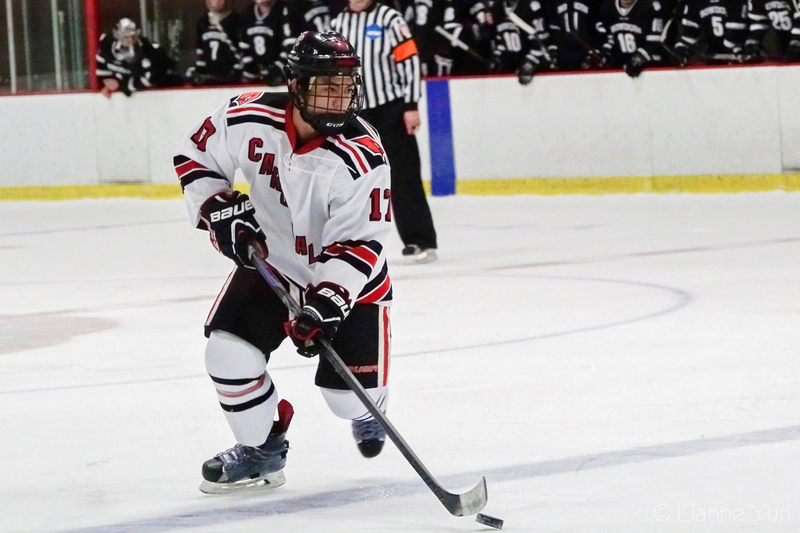 The Polar Bears would then pull ahead in the second period when Spencer Antunez scored midway through the second period, assisted by Brendan Conroy. However, captain James Kline ’17 found Andy Espinoza ’19 on a power play opportunity, which beat Cronin to even the game at 2-2. 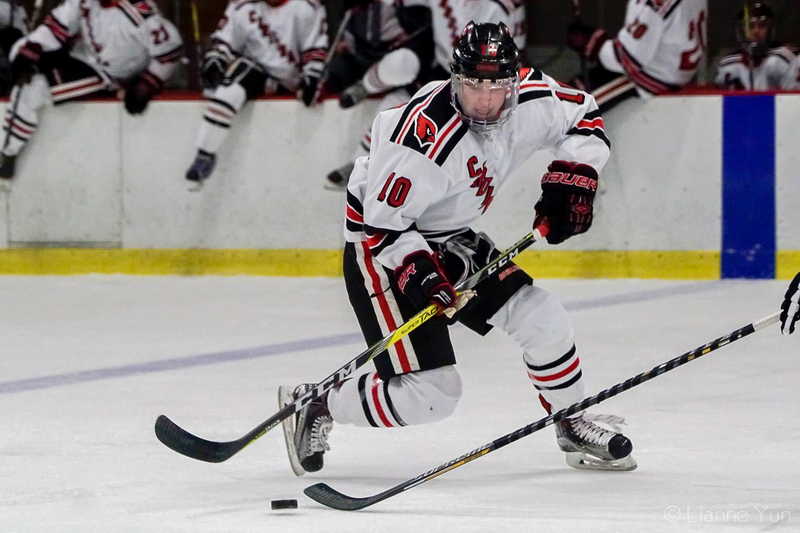 Wesleyan scored its second goal of the period when Luke Babcock ’19 beat Cronin through the five-hole in the waning minutes of the period, handing the Cardinals a 3-2 advantage. The game remained scoreless for the remainder of the period (and most of the third as well) until Jordan Jancze ’18 netted his first goal of the year at 15:45 to give the Cardinals some insurance. Just over a minute later, Jancze’s goal would prove to be the difference as Bowdoin once again snuck one past Sprigings to cut their deficit to one with just over three minutes remaining in the game. In the final minute of the game, Cronin skated for the bench to bring on the extra attacker for the visitors; Harris won the ensuing faceoff at center ice, and Kline secured the puck before firing it into the open net to ensure a critical win for the Cardinals on home ice. Sprigings continued the trend of strong play in net for the squad, something the team has had going for them all season long. The Cardinals enjoyed the win before turning their attention to another crucial matchup less than 24 hours later. Following the hard-fought victory against the Polar Bears, the Cardinals welcomed another foe that calls Maine home: the No. 14 Colby Mules. With a prime opportunity to prove their mettle and improve their position in the standings, the Redbirds looked to pull off the upset on home ice. Early in the first, Kline had a good scoring chance when he attempted to stuff the puck into the net from the crease. However, Colby goaltender Sean Lawrence stonewalled the Wesleyan captain in what would amount to the best scoring chance of the opening period. Just over two minutes into the second period, Colby’s Michael Rudolf broke open the scoreless tie when he beat George Blinick ’19 high on the glove side. Although Blinick held the visitors scoreless for the rest of the period, the Mules extended their lead to two when Cam McDonald buried a juicy rebound past Blinick. 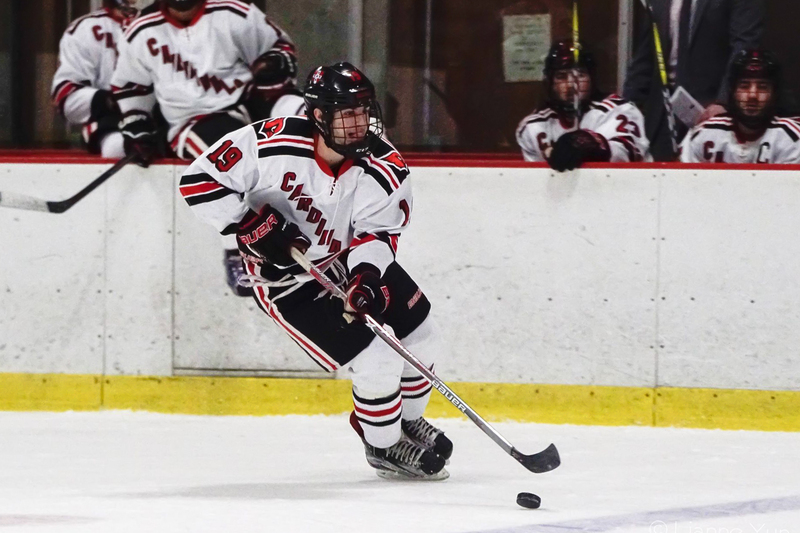 However, the Cardinals would not go down without a fight; just under two minutes later, Cam McCusker ’18 converted a power play opportunity into a goal with assists from the underclassman duo of Malinowski and Harris. The Mules answered right back with another goal, however, as Rudolf was able to beat Blinick once again to re-establish a two goal lead for the visiting Mules. Down two in the final minutes, it was now Wesleyan’s turn to pull their goaltender for the extra attacker, a decision that would pay off. A shot by Theo Tydingco ’18 rang off the post, but Kline was right there to convert the rebound chance into a score with 42 seconds remaining in the game. However, Kline’s goal was all the Cardinals could muster with the extra man, and the Red Birds fell by a final score of 3-2. The loss marked only Blinick’s second of the year; the sophomore goaltender has had a fine season supporting the senior incumbent Sprigings. Kline’s 23 points on the year lead the team, but Harris, the standout first-year skater for the Red and Black follows closely with 20 points, which tied the mark for most productive rookie in the conference. In addition, led by players such as Kline, Harris, and Jancze, the team has the best penalty kill rate in Division III hockey at 94.4 percent. Now, only two games remain for the squad before the postseason begins. The team wraps up its season with a two game set against fellow Connecticut foe Trinity. The Cardinals will honor the six seniors on Friday night at 7 p.m., before heading to Hartford on Saturday night to conclude the regular season. Points this weekend will be essential, as Trinity sits just one spot ahead of the Cardinals and in position to open the playoffs at home. If the Cardinals want that opportunity, they must play inspired hockey this weekend.